Nick and Nate Holley always seem to be on the same football team, with two exceptions. One time was last season, when Nick was a fifth-year senior at Kent State, and Nate had finished his college career the season before. The other time was in the middle of May, when Nick signed as an undrafted free agent with the Los Angeles Rams. Nick and Nate, 23-year-old twin brothers, went to the Rams’ rookie minicamp tryout, but they didn’t have a spot for Nate at the time. Still, the Rams were interested in Nate, telling Nick to make sure his brother stayed ready. Nick wanted his brother to get a chance, so he regularly reminded the team’s coaches, scouts, and general managers about bringing on Nate. 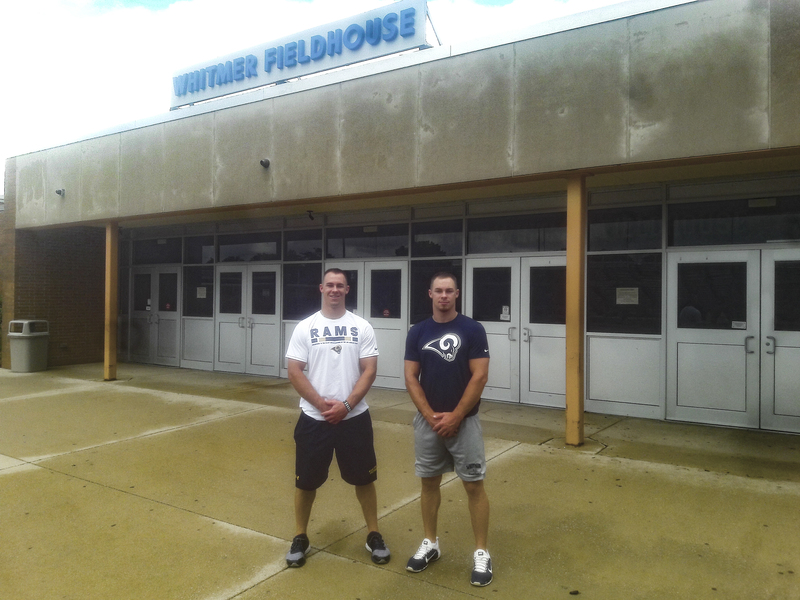 Nate finally signed June 8 with the Rams, and the Whitmer High School graduates are together again pursuing their dream of playing in the NFL. They’ll report for training camp with other rookies July 23, and camp begins July 26. As Nick and Nate compete for spots on the 53-man roster, they’ll have to show what is perhaps their most valuable trait: their work ethic. Nick and Nate currently are working on special teams and are in backup roles at their respective positions. Nick, who played quarterback the last two seasons at Kent State but suffered a season-ending knee injury three games into 2017, said the Rams see him as a change-of-pace running back, similar to Carolina’s Christian McCaffrey. He has been used in the slot as well. Nate, a safety who made 424 tackles in four seasons with the Golden Flashes, said the Rams have had him play strong and free safety so far. As the brothers try to make the team, their older sister, Randi, knows their work ethic will show. “They want to be the best, they want to perform,” Randi said. The grind Nick and Nate will go through won’t be anything new. Since playing at Whitmer, the two have had to work hard for what they want. Neither received any full scholarship offers from colleges during their senior season in 2012, leading Whitmer to the Division I state championship game. Jerry Bell, their former coach at Whitmer, said Toledo talked with them about walking on. But Nick, the 2012 Blade Player of the Year, received an offer from Kent State during the final week of recruiting before national signing day in 2013, visiting the school the weekend before. On that Saturday morning, Nate sat down with former Kent State coach Paul Haynes, former recruiting coordinator Ben Needham, and the rest of the coaching staff. Nate impressed the coaching staff so much he received an offer and joined Nick in signing. Along with the challenges they faced heading into college, Nick and Nate also had obstacles before signing with the Rams. Nick thought he would be drafted in one of the later rounds and, if that didn’t happen, he expected to be a priority free agent. He said he had around 20 teams contact him multiple times after the draft, but then he suddenly stopped getting calls. Nick said the issues that arose stemmed from the knee injury he suffered during his senior year. He said teams weren’t sure what was going on with his knee, so they didn’t want to take a chance. The Rams eventually put Nick through a physical, which he passed, allowing him to sign with the team. “Every day is a blessing, and I wake up and say, ‘You know what, I get to live my dream,’ and there’s nothing better than that,” Nick said. As Nick overcame his challenges on the road to the NFL, Nate had his own. During his senior year at Kent State, Nate was arrested in November, 2016, on charges of kidnapping and assault. He was suspended from the team indefinitely after his arrest, and he was found not guilty of both charges in February, 2017. Nate wasn’t drafted in 2017, and he didn’t play football for a year. Still, he continued to train and remained confident about getting an opportunity. This past spring, Nate played in the NFL Spring League, and about two weeks before getting a call from the Rams, he got a call about playing for the Nebraska Danger, a team in the Indoor Football League. He played for the Danger for two weeks before the team had a bye week. Nate got a call from the Rams halfway through the Danger’s bye week, and the team flew him out to Los Angeles. The process of Nate going from playing in the Indoor Football League to signing with the Rams was quick, but he was prepared for an opportunity. In all the adversity Nick and Nate have gone through, Bell knows the two have the tools to make it in the NFL. “They’re determined to not let anything stand in their way of accomplishing their dream, and it’s all through hard work and determination,” Bell said. With training camp ahead, Nick and Nate have another opportunity on the horizon. When the two were looking to get a scholarship offer in high school, Bell knew all they needed was one chance. Now, Nick and Nate are getting another chance to achieve their dream together, and with their work ethic, it’s a dream they have a good chance of achieving.